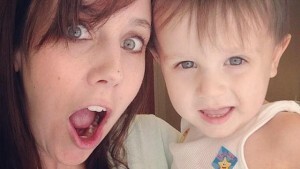 Editor’s Note: Kira Kroboth, a Raleigh mom who wrote for Go Ask Mom several years ago after the birth of her first child, will be sharing her family’s journey as they seek treatment for her younger son’s peanut allergy. 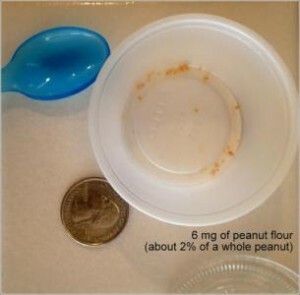 Last week, my son Elias consumed 25 mg of peanut flour. What looks like a pinch of bread crumbs to most looks far different to me. It looks like hope. Progress. Horror. Fear. And then more hope on top! You see, I’m an “allergy mom.” My son was diagnosed at 15 months with a life-threatening peanut allergy. After months of random, unexplained hives – always after big brother had eaten peanut butter – I had my suspicions. One day, I gave him a peanut butter cracker determined to find out once and for all what we were dealing with. I stepped to the sink and back. He was covered in hives from his mouth to his elbows. Tons of them. Gulp. He’s allergic. If I knew that day what I know now, I wouldn’t have attempted giving him peanut butter at home. I would have done it in an allergist’s office, or maybe even the ER parking lot. Things settled down with Benadryl, thankfully. But I had no EpiPen on hand. And that dose of epinephrine would have saved his life had his reaction escalated that morning. That little, round-peanut-butter-smeared cracker changed our lives. A visit to the pediatrician and later, testing with an allergist confirmed the peanut allergy. And confirmed it was indeed life-threatening. We were sent away with a prescription for epinephrine and instructions to strictly avoid all nuts. That bag of Snyder’s pretzels we all snacked on? Tossed. The can of Veg-all for my casserole? Tossed. Both contained nut warnings. All of a sudden everything felt scary. I felt an overwhelming, intense need to learn more about food allergies and protect my child at all costs. I had no inkling how serious food allergies are. I had no clue that potting soil has sent children to the ER because of peanut shells used as filler. I didn’t know I should be on the lookout at mulched playgrounds. I began wiping down all eating surfaces not because I was scared of the flu, but because I needed to remove any trace of anything related to nuts. I needed to keep my child safe — and alive. Somewhere along the way, and I still can’t remember how, but I landed in a Facebook group called Peanut Anaphylaxis Cure. There, parents were talking about a treatment called Oral-Immunotherapy that was successfully desensitizing kids with food allergies. I learned there were clinical trials taking place across the country for OIT – with the closest being at UNC. I signed us up for any applicable trials, but heard that the chances of getting in were slim. But there also board-certified allergists offering this treatment privately. And one happened to be right here in Raleigh. I called that allergist’s office – Dr. Scott Nash with Nash Allergy and Asthma. I made an appointment. I asked about OIT and sure enough, he does offer the treatment. We talked through pros and cons. We discussed why it’s not an “approved” treatment yet. I read countless accounts from other parents and their children in OIT. I read about Dr. Nash’s experience. And I went with my gut. We needed to do this for Elias and for our family. So, March 25 of this year, we walked in for our first day of OIT. It consisted of about eight hours in Dr. Nash’s office with my now 25-month old escalating from tiny, miniscule amounts of peanut flour and ending with consuming 6 mg of peanut flour. We started at .1mg. Yes, POINT one. I have much more I can and will share about OIT. Today, we updosed to 25 mg. Successfully! We’ve had no reactions thus far. And, hopefully, after two years of daily consumption under the direction of Dr. Nash, we will be freed from his allergy via desensitization. I want to share the story of Elias. I want to share the story of this treatment, and others on the horizon. I want to share the story of being an allergy mom. I want to increase awareness. I want to share the concern and real fear of living with a food allergy. I want to maybe, somehow, shape the food allergy landscape in some small way. It’s a very real thing. And it’s really very scary. But for now, we’ve found hope.